When packing your prepper pantry, be sure to include plenty of popcorn. I’m talking the unpopped kernels, unadorned by the fancy microwavable packaging. You can buy a one-pound bag of popcorn kernels for a dollar or two in any grocery store, or look for bigger bags and better bargains at a warehouse store. Unpopped popcorn has a tremendously long shelf life. 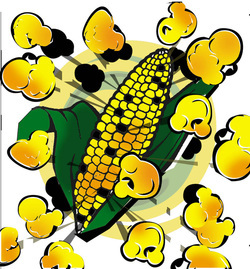 In ancient tombs of Peru, archaeologists found kernels of popcorn that were so well preserved that they still popped. Another expedition found popped popcorn in a cave in Utah which, after being dusted off, was still remarkably fresh in spite of being a thousand years old! One dig near Mexico City uncovered pollen of the popcorn plant. It was almost identical to modern popcorn pollen, yet it was 80,000 years old – indicating that humans have been enjoying popcorn for many thousands of years. Indeed, Cortez found the Aztecs eating it when he invaded in the early 1500s. Columbus took it back to Spain with him. Indians brought a bag full of popcorn to the first Thanksgiving dinner, where the Pilgrims must have been delighted with it. Popcorn is a good comfort food. In his book Making the Best of Basics, prepper James Stevens mentions a post World War II study by Dr. Norman Wright of the British Food Ministry, which found that people are more likely to reject unfamiliar or distasteful foods during times of stress than under normal conditions. By contrast, however, favorite familiar foods can offer a great deal of comfort during trying times. This was borne out by the fact that during World War II (when sugar was rationed) Americans changed their snacking habits and ate three times as much popcorn as they had before. A common danger of doomsday food storage is called “appetite fatigue”. If you’ve got nothing to eat but rice, beans, and wheat, a big hot fluffy bowl of popcorn will be a great change of pace. A popcorn kernel must have a moisture content of about 15% in order to pop. When cooking, the hull is so tight that the water within the kernel cannot escape until it boils into steam, bursting the hull apart and cooking the soft starchy interior. Because each kernel is 15% water, and because water is the enemy of food storage, some preppers dehydrate their popcorn by placing it on a cookie sheet in a low-temperature oven for several hours before storing it. However, if the water content falls below 15%, the popcorn won’t pop any more. Therefore, when bringing dehydrated popcorn out of storage, you can spritz it with water, shake it up, let it sit in a baggie for a day, and then pop the rehydrated kernels. However, I know of one prepper who did nothing special at all to their popcorn and it popped just fine after being in storage for nine years. Personally, I think storing normal kernels in Zip-Locks, mylar, or vacuum storage bags in a temperature-stable environment is good enough, especially if the packages are packed into air-tight containers such as tin canisters or food grade buckets. Many preppers store popcorn in clean, dry two-liter pop bottles, which is another excellent option. If you pull your popcorn out of storage and it won’t pop, even after being re-hydrated, all is not lost. Run those kernels through your wheat grinder to turn them into corn meal for polenta, corn bread, or tortillas. Feed them to your chickens or goats, or use them as bait for squirrels. Don’t forget, too, that these popcorn kernels are seeds, and they may still be perfectly viable. Soak them in water, sprout them, and then eat the vitamin-packed sprouts on salads, or plant them and grow more popcorn. Please do not store microwavable popcorn. There’s oil in those microwavable bags, and oil spoils. To pop popcorn without benefit of a microwave, simply find a nice sturdy pot with a lid that allows some venting of steam, otherwise your popcorn will get soggy. Cover the bottom of the pan with about 1/3 cup of vegetable oil for every cup of popcorn used. Don’t use butter, which will scorch. Put a few kernels in the pan and cover; when they pop, the oil is ready. Put enough kernels in the pan to cover the bottom one kernel deep. Shake the pan to be sure the oil stays well distributed. If the oil is smoking, it’s too hot. Remove the pan from the heat as soon as the popping begins to slow. The heated oil will continue to pop the remaining kernels. Don’t add salt until after the popping is done, because pre-salting will toughen the popcorn. Popped popcorn can be used in a variety of ways. Season it with honey or corn syrup (both of which are excellent ‘forever’ foods), sprinkle it with cinnamon, mix it with peanuts, almonds, or other nuts, or poor milk over it and eat it as cereal. (People were doing that long before breakfast cereal was even invented.) There are about 1,600 kernels in a cup of popcorn, and a single ounce of kernels (which is about two tablespoons) will expand to produce about a quart of popcorn. Each kernel expands to about 40 to 50 times its original size. Although a cup of popped popcorn contains only about 50 calories, it’s high in fiber, very filling, and just plain fun to eat. So, next time you’re in the junk food aisle, stocking up on fun foods to eat today, be sure to put a bag of popcorn kernels into your shopping cart in order to provide some fun food for the future. Here's an article about ancient Peruvians eating popcorn.